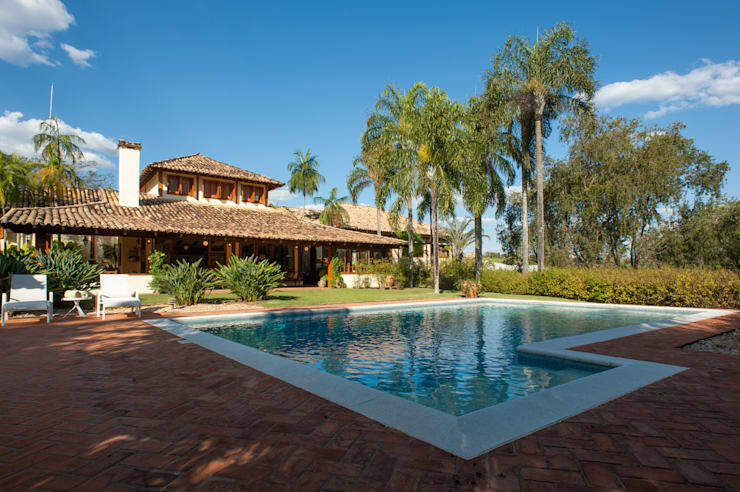 Today we are going to visit São Paulo, where we come across a very impressive and very beautiful colonial house, where the designers have managed to merge traditional elements with a more modern look and feel. We are also going to see how effectively wood has been used throughout this house, in different forms and for different functions, to create a wonderful, warm and inviting home. There are so many different rooms to explore in this beautiful home that it's difficult to know where to start. We will witness how the architects have used every square metre of the plot of land to their advantage, creating a special and entrancing place where each room flows onto the next. With space for the whole family to come together and interact, or have some private time, this is a home that any of us would be lucky to live in! Right from the entrance, we can see how wood is used so perfectly and so effectively. A wide, beach wood pathway, flanked by trendy and decorative garden stones, opens up onto double-doors, which are finished in a caramel-coloured wood. It looks as if we are about to enter a gorgeous cottage! The extensive use of wood has been broken up by the lovely glass windows, which soften the entire like and feel. Secured with dainty and subtle burglar bars, these windows add to the sense of warmth. If you like them have a look at these doors that dare to be different. The rest of the exterior is very subtle, with cream walls and chocolate brown finishes. Already from this angle, we can see that plants and flowers are going to play a big part in the design of this home! If we go around to the back of this home, we can't believe our eyes. From the front, the home looked subtle and understated, but from the back it is grand and impressive! 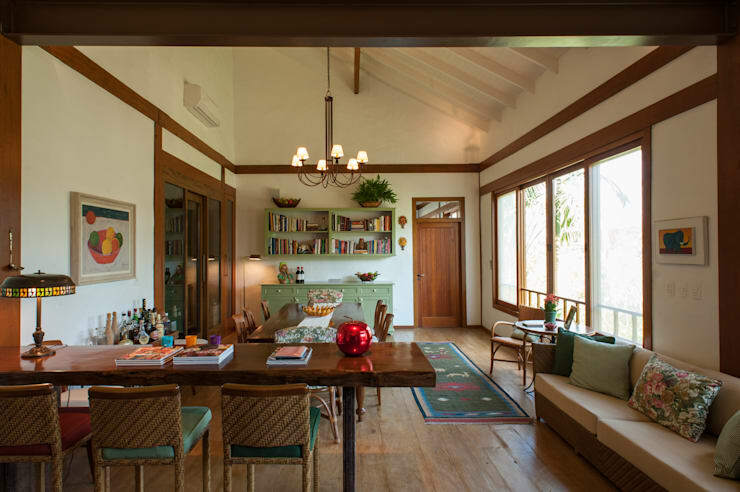 The home, which takes on a colonial design with a touch of Balinese style, opens up onto a large garden and pool area. The swimming pool is modern and large, allowing for plenty of family activities, games and afternoons swimming! The area surrounding the pool is also expansive, allowing for sunbathing, pool parties and braai's. You'll see that the designers have paved it with bricks, a great material for around the pool! Not only does it look great, but it will last long and you are less likely to slip on it. Around the pool, we can see a very large garden that is packed with tropical trees, plants and flowers. Don't be deceived, a garden like this takes a lot of hard work to maintain, yet can have such an incredible effect. Be sure to spend some time working on your own garden to create a similar look and feel. When we enter this beautiful colonial home, we can see that the same neutral colours that we experienced outside are mirrored throughout the interior. The cream walls and chocolate brown finishes work in perfect harmony with the light, wooden walls. We can also see that the designers have added a face brick facade to the space, which adds texture and tone. Lighting is key to the interior of a home and the designers here have taken this to heart. While natural light filters in through the front door and the large windows, they've installed a very elegant chandelier, which is both functional and beautiful. A dash of colour, personal touch and warmth is added in the form of a painting, some cushions on the bench, hats hanging on the rack and a rug. 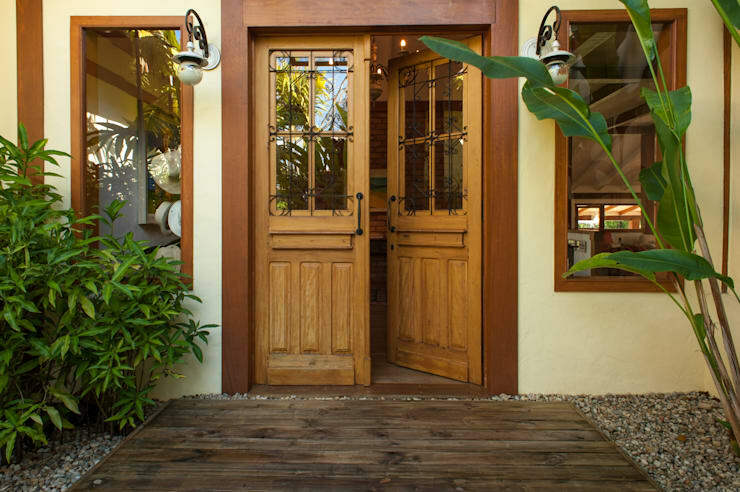 Have a look at these tips: Give your entrance some wow factor! As we move into the heart of the home, we witness just how hearty it is. The designers haven't gone for a retro look and feel, instead sticking to more classic and subtle pieces of furniture. Don't you love the wicker chairs that line the big, wooden desk? Furniture determines what the interior of your home will look like and feel like. It should also work to enhance the architecture. The designers have achieved just that here! Wood is the dominant material, but the designers have added a soft, mint green to the mix in the form of cushions, a cabinet and shelving. The shelving is as functional as it is decorative, storing the books neatly away. Have a look at the homify dining room products for inspiration when it comes to your own home! 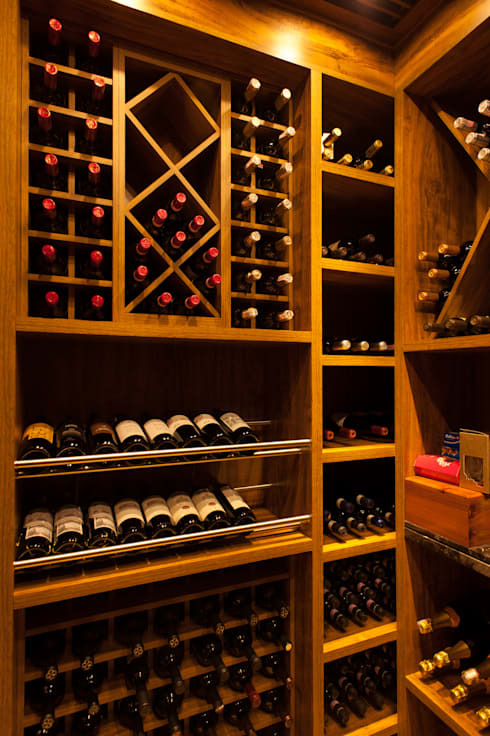 This is a very special part of the home—the wine cellar! Anyone who owns a home like this needs to know their wines. They also need a cool and dry space to store them. In this home, the designers have created a full-on cellar, which is fitted with varying wooden shelves and cabinets. Don't you think the design of the shelves enhances the wine display? This room also is a modern and stylish addition to the home! We end off our tour in the kitchen, the true heart of the home. 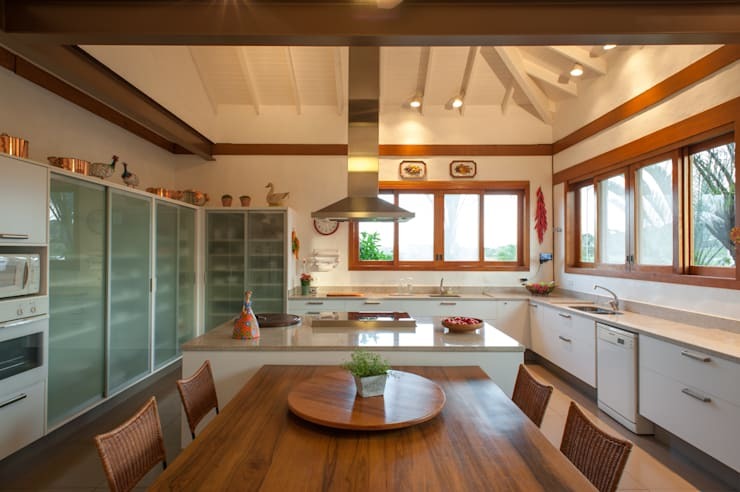 The kitchen is large and impressive, with a large island for cooking and preparing food. There is also a beautiful dining table and chairs, which allow for more casual meals such as breakfast. Crisp white cupboards run along the entire perimetre of the space, iced with cool granite counter tops. You'll notice that there is plenty of storage space in the kitchen, allowing for condiments, cutlery and crockery to be stored neatly out of sight. This creates a very minimalist look and feel, where only the functional items are out on the counters and on the table. A neat kitchen is a happy kitchen! The large glass windows allow for sunlight to flow into this space. 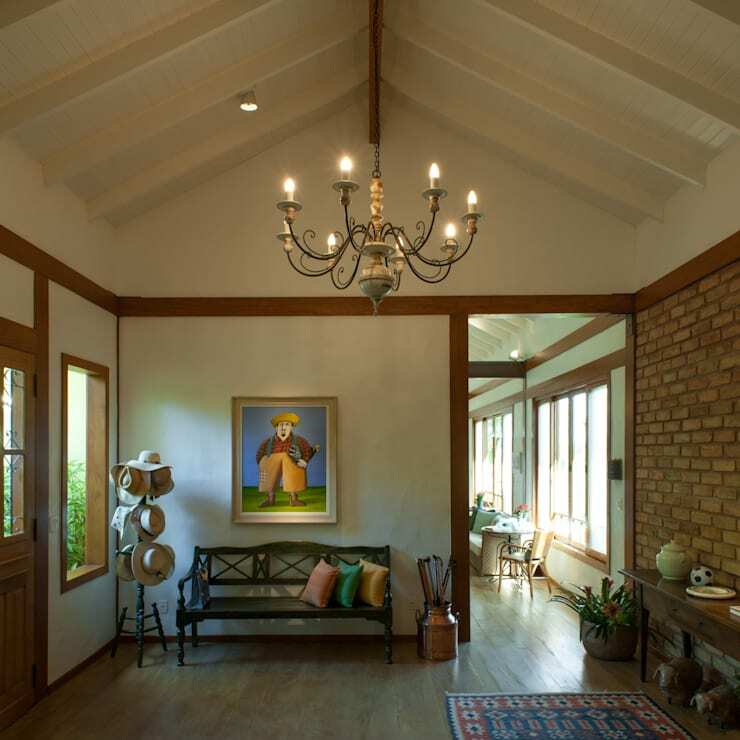 For extra light, however, the designers have installed ceiling lights on the high ceiling beams. The overall effect is a very warm and light kitchen. This home is so comfortable and warm, we feel like it should be on a farm or in the country. What do you think of this lovely home?